Rev. 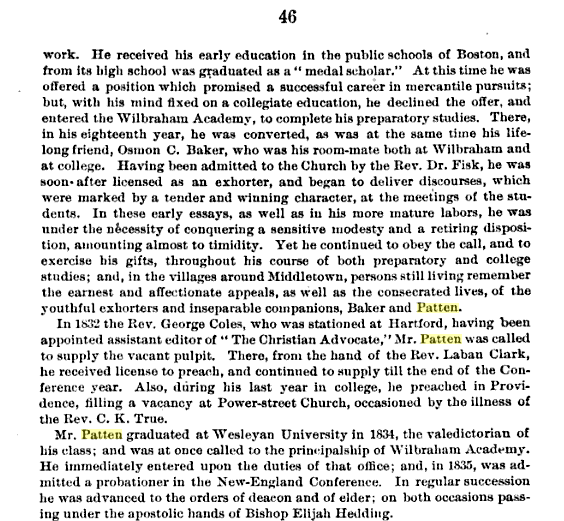 David Patten was principal at Wilbraham Academy from 1834 to 1841. While there, he signed a page in the autograph album of Miss Elizabeth Ford. Some of the signers named their institution as Wesleyan Academy or Wesleyan Seminary. An alphabetical list of approximately sixty signers appears at the end of the post. The ink on some pages has faded to the point of illegibility. 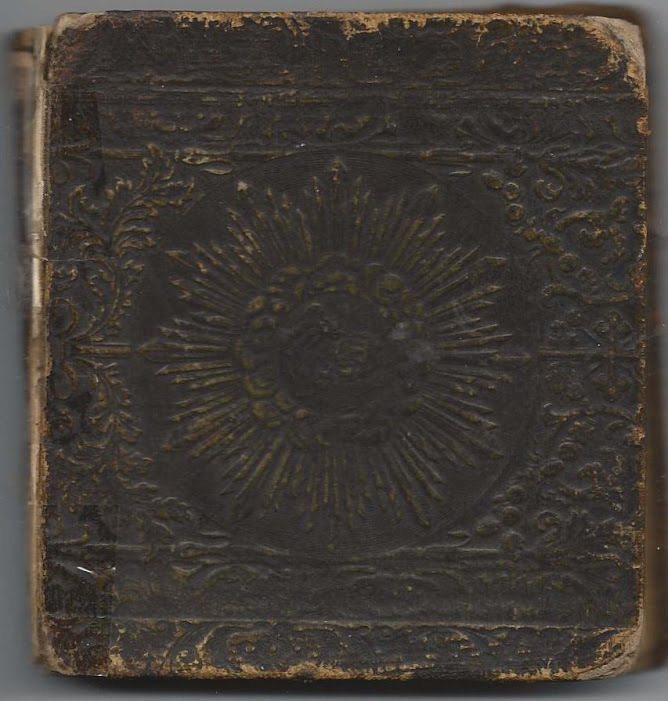 See other posts featuring the owner of the album, Miss Elizabeth Ford, and Wilbraham Academy student Isaac Jennison, Jr., who later became a teacher there. Shown below is the title page. The album is approximately 4" x 4-1/4" and rather thick for an album of this size, though the paper stock is itself thick. Most pages are signed. Floral illustrations are interspersed throughout. The photograph above was taken from the History of the Wesleyan Academy at Wilbraham, Massachusetts, 1817-1890, by David Sherman, published in 1893, which includes a section on principal David Patten. 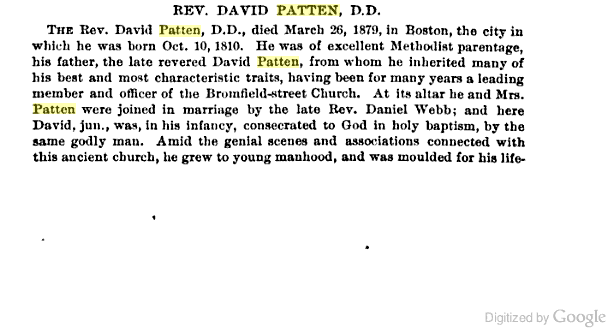 David Patten, Jr., was born 15 October 1810 at Boston, Massachusetts, the son of David and Sarah Hazelrigg (Colburn) Patten, who were born at Billerica, Massachusetts, and Roxbury, Massachusetts, respectively. 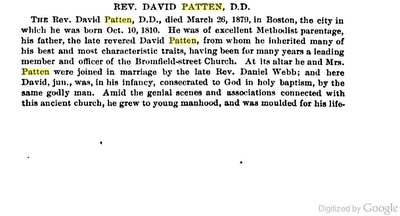 David Patten, Jr.'s paternal grandparents were William and Rebecca (Brown) Patten. His maternal grandparents were Levi and Rebeckah (Strobridge) Colburn. 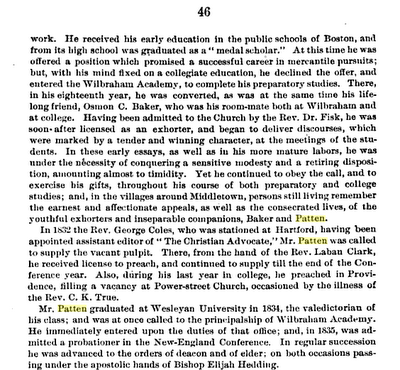 David Patten, Jr., graduated as a "medal scholar" from English High School at Boston, Massachusetts and then entered Wilbraham Academy, a Wesleyan academy, in Wilbraham, Massachusetts, to prepare for college. While at Wilbraham Academy, he converted and began preaching to his fellow students. 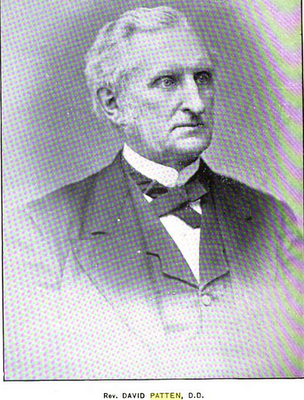 He then entered Wesleyan University at Middletown, Connecticut, from which he graduated in 1834 as valedictorian. After graduation, he served for seven years as principal at his former alma mater, Wilbraham Academy, during which time he signed the page in Elizabeth Ford's autograph album. 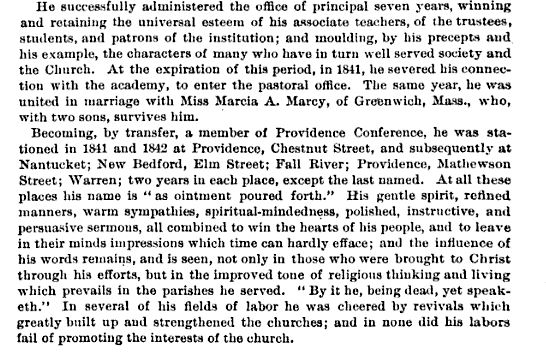 In 1841, he resigned his position at Wilbraham Academy and moved to Providence, Rhode Island, where he became Presiding Elder of the Providence District of the Methodist Episcopal Church. 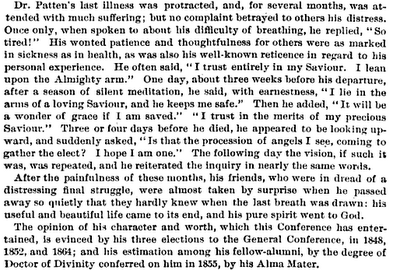 He was there during the Dorr Rebellion, a difficult time for his congregations and all Rhode Islanders. On 31 August 1841 at Greenwich, Massachusetts, David Patten married Marsia Ann Marcy, daughter of Senator Laban Marcy and wife Fanny (Howe) Marcy. Marsia was born 20 June 1822 at Greenwich. 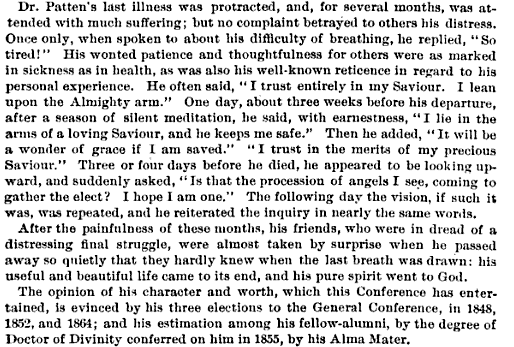 In 1854 Rev. 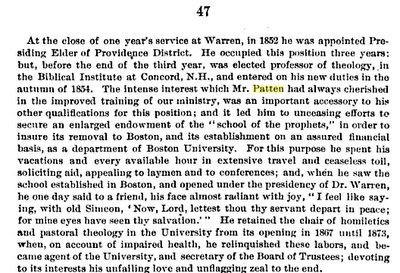 Patten became a professor of theology at the Biblical College at Concord, New Hampshire. 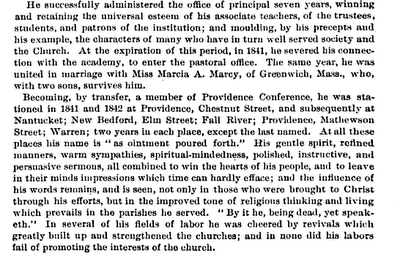 In 1866 the family moved to Boston, Massachusetts, where Rev. Patten took a position as professor of homiletics and pastoral theology. 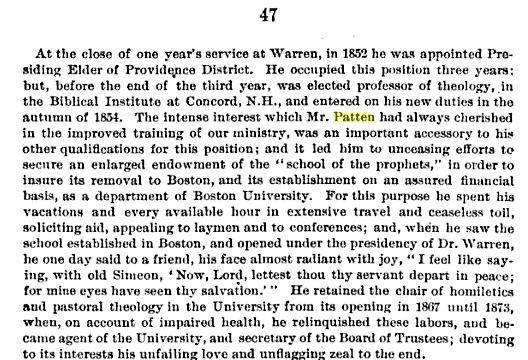 In 1873 he became Registrar of Boston University, a position he held until his death on 26 March 1879 at Boston. Julia of Hartford; Connectict, I assume. 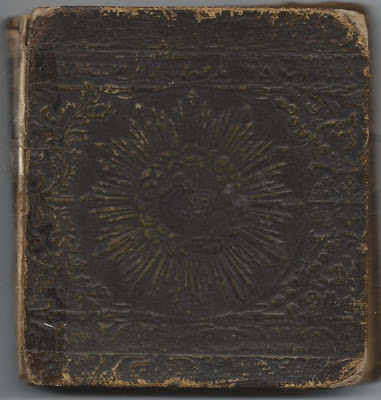 M. P. C., not sure of middle initial; possible fiance of student and later Wilbraham teacher Isaac Jennison, Jr.
Frances Keep of South Lee, Massachusetts, signed at Wesleyan Academy at Wilbraham, Massachusetts, in 1836. Clarissa O'Brien signed a page for her niece Elizabeth Ford at Durham in 1839. She possibly was Clarissa (Sanford) Durham married to John O'Brien, who could have been the J. O'Brien who also signed a page in Elizabeth's album and called himself her Uncle. Eliza Pelton of Middlefield, Massachusetts, signed at Wilbraham, Massachusetts in 1836. Elizabeth added a note that Eliza died at Baton Rouge, Louisiana in 1838. Initials, possibly I. T. R. or J. T. R.
A. Richmond of Westford, Connecticut; uses term "Amicus", so I assume the signer was a male.